In part 1 of this project I had Python open up a spreadsheet and count how many new faculty members I have for this fall. In part 2 I decided to make it tell me their names. Looking at the spreadsheet I can see that First Name, Last Name, and Department are the details I want to pull, provided the department matches the list I’m responsible for. 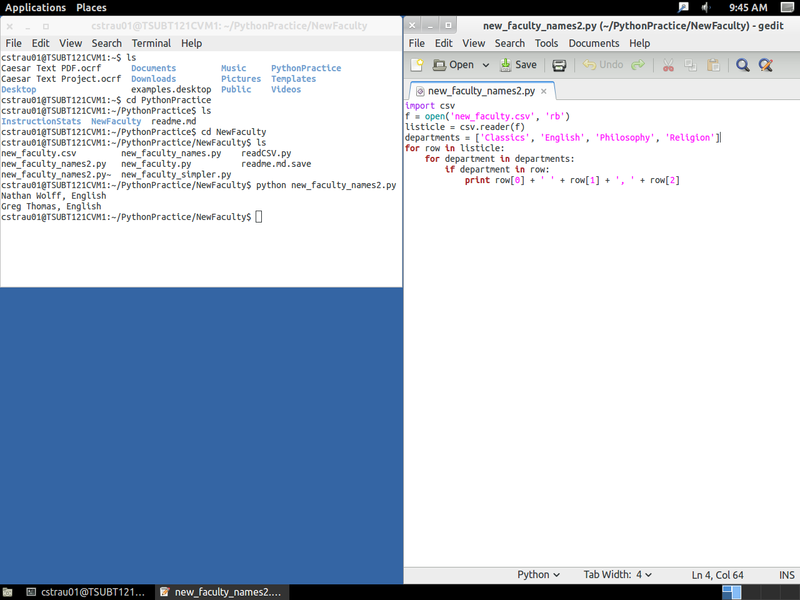 Python is very literal-minded about what it prints, so I had to manually tell it to print spaces and commas. Likely there is a better way to do that, but that is a project for another day. Next project: Getting Python to export this data to a file. After I figure out how to push updates to Github from the Linux virtual machine I’m coding on.